The past week has been very dislocating for me, on a number of levels. Following my holiday in Turkey, it was almost immediately back to the airport for workshops in Oslo and then Amsterdam. Just as the holiday got me thinking about how who we are affects how we are, so too did the workshops provoke similar thoughts, albeit in a very different direction. In both cases, I’d been invited to join debates about the increasing levels of opposition and contestation of European integration. In one case, that meant talking with a lot of constitutional lawyers and sociologists; in the other, talking with a lot of methodologists. In neither case – it would be fair to say – was I totally in my comfort zone. Both groups brought their own worldviews and preconceptions to the debate, talking about a lot of the same material in very different ways, as you might expect. For me, the interesting thing was how I had to adapt and shape what I had to say to fit to those debates. Of course, you could argue that I could have just done what most academics do most of the time – say what you want to say, regardless – but I felt it incumbent on the generosity of my hosts to at least to make it a productive interaction, rather than just a simple exposition. Besides, I like a challenge. As a result, I found that both times I was reformulating what I had planned to say right up to the last minute, so as to try and pick up on the emergent themes. My informed guesses about what we might talk about were sort-of right, but not quite. In addition, people said interesting things that related to what I was thinking about, so I needed to adjust there too. 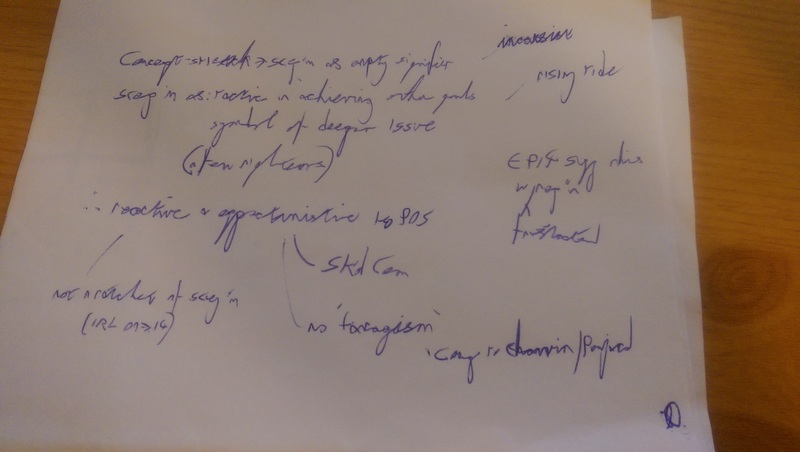 As you can see from my notes, it’s not pretty, but I got a lot of positive and constructive feedback on what came out and I feel confident that I added something to the discussion. In short, it was a lot like teaching: using the contributions of the others in the room to build and advance the collective understanding. As a firm believer in active learning, it’s only right that I should acknowledge the value of that outside of its home environment. To me – and quite possibly to you – that sounds both reasonable and obvious, but I think we can all bring to mind colleagues who see teaching and research as antithetical. Even I would admit to a certain haziness about what ‘research-led teaching’ actually consists of . However, as this past week has underlined for me, we need to recognise the fundamental linkage between the two, as well as the carry-over of practice. All the things we talk about in teaching – clarity, engagement, collaboration – are also good values in research. If nothing else, if we can’t communicate our research properly, then the effect is much the same as if we can’t communicate our teaching properly: a bunch of people staring at you blankly.